The decision comes after the carmaker decided earlier this year to separate its operations in China from its international business. Singapore offered several advantages, the firm said, including proximity to its key markets outside China. 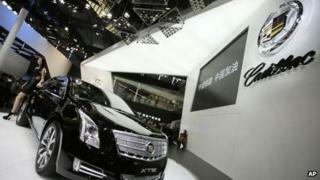 GM said it would continue to keep its office in Shanghai open. Lori Arpin, vice president of communications at GM International Operations, told the BBC that the firm had looked at a number of possible locations for their new international operations and decided Singapore was the best. The new headquarters, which will have about 120 staff, will work across sales and marketing, product planning and communications. Ms Arpin said the move away from Shanghai was likely to take place between April and the end of June. "Currently we have a distribution centre in Singapore and part of the new headquarters team will be made up from that existing staff base," Ms Arpin said. In August this year, GM moved to separate its China operation and its international operations into two groups. The split was designed to allow the company's mainland business to focus on China, which is the world's largest car market. "The international arm of GM is no longer responsible for the China market," Ms Arpin said. "China will now stand on its own - because we believe it demands that focus."